The Barn swallow (Hirundo rustica) is the most widespread species of swallow that can be found worldwide. A distinctive passerine bird with blue upperparts, a long, deeply forked tail and curved, pointed wings, it is found in Europe, Asia, Africa and the Americas. The barn swallow is the national bird of Estonia. 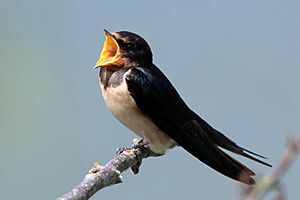 The adult male barn swallow is 17–19 cm (6.7–7.5 in) long including 2–7 cm (0.79–2.76 in) of elongated outer tail feathers. It has a wingspan of 32–34.5 cm (12.6–13.6 in) and weighs 16–22 g (0.56–0.78 oz). It has steel blue upperparts and a rufous forehead, chin and throat, which are separated from the off-white underparts by a broad dark blue breast band. The outer tail feathers are elongated, giving the distinctive deeply forked "swallow tail". There is a line of white spots across the outer end of the upper tail. The female is similar in appearance to the male, but the tail streamers are shorter, the blue of the upperparts and breast band is less glossy, and the underparts paler. The juvenile is browner and has a paler rufous face and whiter underparts. It also lacks the long tail streamers of the adult. H. r. rustica, the nominate European subspecies, breeds in Europe and Asia, as far north as the Arctic Circle, south to North Africa, the Middle East and Sikkim, and east to the Yenisei River. It migrates on a broad front to winter in Africa, Arabia, and the Indian subcontinent. The barn swallows wintering in southern Africa are from across Eurasia to at least 91°E, and have been recorded as covering up to 11,660 km (7,250 mi) on their annual migration. 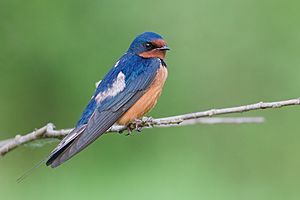 The barn swallow typically feeds 7–8 m (23–26 ft) above shallow water or the ground, often following animals, humans or farm machinery to catch disturbed insects, but it will occasionally pick prey items from the water surface, walls and plants. In the breeding areas, large flies make up around 70% of the diet, with aphids also a significant component. However, in Europe, the barn swallow consumes fewer aphids than the house or sand martins. On the wintering grounds, Hymenoptera, especially flying ants, are important food items. When egg-laying, barn swallows hunt in pairs, but will form often large flocks otherwise. 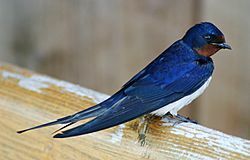 As its name implies, the barn swallow typically nests inside accessible buildings such as barns and stables, or under bridges and wharves. The neat cup-shaped nest is placed on a beam or against a suitable vertical projection. It is constructed by both sexes, although more often by the female, with mud pellets collected in their beaks and lined with grasses, feathers, algae or other soft materials. 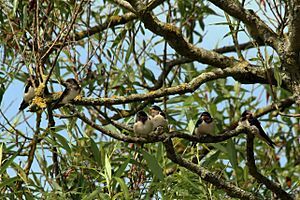 Barn swallows may nest colonially where sufficient high-quality nest sites are available, and within a colony, each pair defends a territory around the nest which, for the European subspecies, is 4 to 8 m2 (43 to 86 sq ft) in size. Colony size tends to be larger in North America. Before man-made sites became common, the barn swallow nested on cliff faces or in caves, but this is now rare. 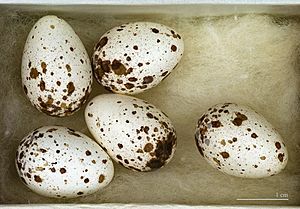 The female lays two to seven, but typically four or five, reddish-spotted white eggs. The eggs are 20 mm × 14 mm (0.79 in × 0.55 in) in size, and weigh 1.9 g (0.067 oz), of which 5% is shell. 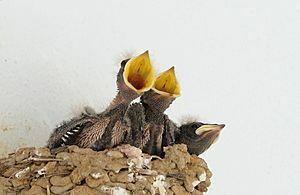 In Europe, the female does almost all the incubation, but in North America the male may incubate up to 25% of the time. The incubation period is normally 14–19 days, with another 18–23 days before the altricial chicks fledge. 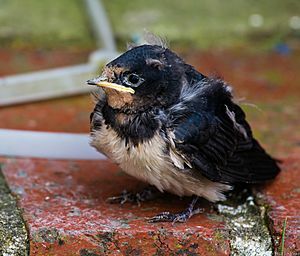 The fledged young stay with, and are fed by, the parents for about a week after leaving the nest. Occasionally, first-year birds from the first brood will assist in feeding the second brood. 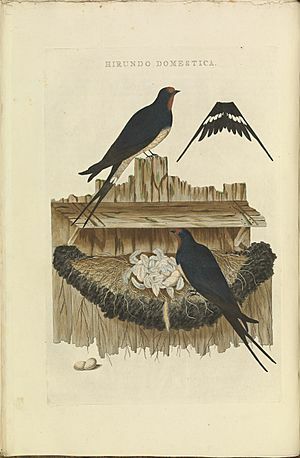 The barn swallow symbolizes the coming of spring and thus love in the Pervigilium Veneris, a late Latin poem. In his poem "The Waste Land", T. S. Eliot quoted the line "Quando fiam uti chelidon [ut tacere desinam]?" ("When will I be like the swallow, so that I can stop being silent?") This refers to the myth of Philomela in which she turns into a nightingale, and her sister Procne into a swallow. On the other hand, an image of the assembly of swallows for their southward migration concludes John Keats's ode "To Autumn". Barn swallow Facts for Kids. Kiddle Encyclopedia.